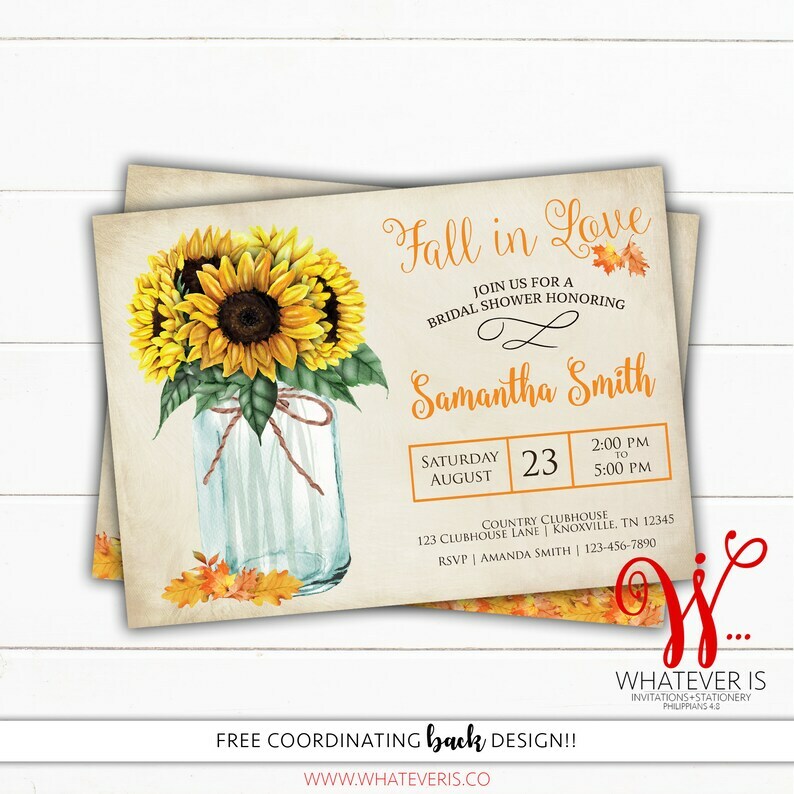 Celebrate the Bride to Be with this Personalized "Fall In Love" Fall Themed Bridal Shower Invitation. •This listing is for 2 high quality JPEG files (front & back) that you can print at home or send to a local printers or photo lab. •You can have as many revisions as needed to get your invitation exactly how you want it! 7. Any additional information you would like added. -Print them at home on card stock. -Send to any photo lab such as Walmart, Sam's Club, CVS, Walgreens, etc. -Send to any online photo lab such as Shutterfly, Snapfish, etc. -OR Let me do the printing for you! I would love to! Your invitations will be printed on high quality card stock and include white envelopes. 1. Choose the Print quantity you need and add it to your cart. **Any card that requires an envelope will be printed in size 5x7. All other cards can be printed in 5x7 or 4x6 unless otherwise noted. If you desire a different size, please message me before purchase to make sure it can be done. - Most of my items are digital files that will be "shipped" via Etsy Messenger. - Printed orders are processed within 24 hours of final approval for printing. Love this design but your hosting a different kind of party/shower? No Problem! I can customize the wording on each of my designs to any type of wording you desire. For instance... Do you love the birthday party invitation but your having a baby shower? No Problem! Just tell me what you want it to say upon purchase and I will be more than happy to change it. ... Please note that the graphics are not as easy to change... if you are wanting something different, please message me first to make sure it can be done! -The invitations and printable's are for personal use only. They are in no way to be shared, re-sold, or recreated under any circumstance.